The FBI's director said Friday the agency is collecting data to present next year in hopes of sparking a national conversation about law enforcement's increasing inability to access encrypted electronic devices. 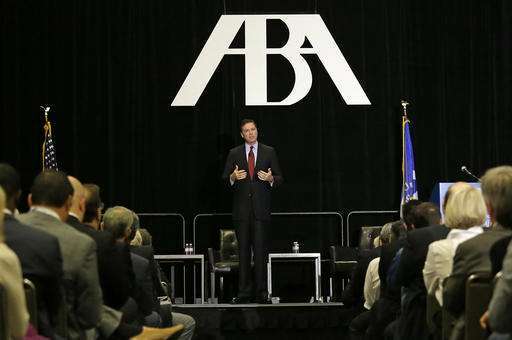 Speaking Friday at the American Bar Association annual conference in San Francisco, James Comey said the agency was unable to access 650 of 5,000 electronic devices investigators attempted to search over the last 10 months. He said the problem is only going to get worse without a discussion about the technology. Comey says encryption technology makes it impossible in a growing number of criminal cases to search electronic devices. But he said it's up to U.S. citizens, rather than the FBI or government officials, to decide whether to modify the technology to help law enforcement access the devices. Comey's concern with encryption emerged earlier this year when the FBI engaged in a high-profile legal fight with Apple over accessing data from a locked iPhone used by one of the two shooters in the San Bernardino, California, terrorist attack. The legal fight remained unresolved because the FBI dropped its court challenge after it said it found a way to access the shooter's iPhone. Silicon Valley companies say encryption safeguards customers' privacy rights and offers protections from hackers, corporate spies and other breaches. "The San Bernardino litigation was necessary, but in my view, it was also counterproductive," Comey said during his 20-minute speech. "It was necessary because we had to get into that phone. It was counterproductive because it made it very hard to have a complex conversation." 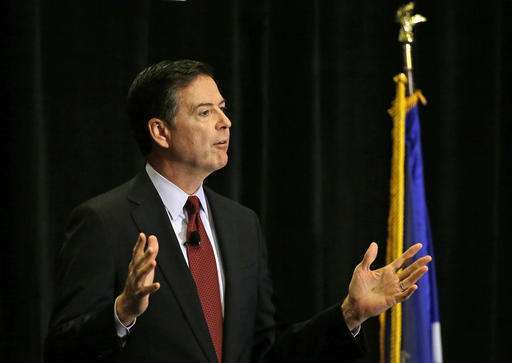 Comey said he hopes a calmer conversation about encryption and its effects on public safety can be started in 2017 after the presidential elections pitting Republican Donald Trump and Democrat Hillary Clinton. Comey chided Clinton on July 5 for being "extremely careless" in using private email servers for government communications while serving as secretary of state, but he recommended no criminal charges. 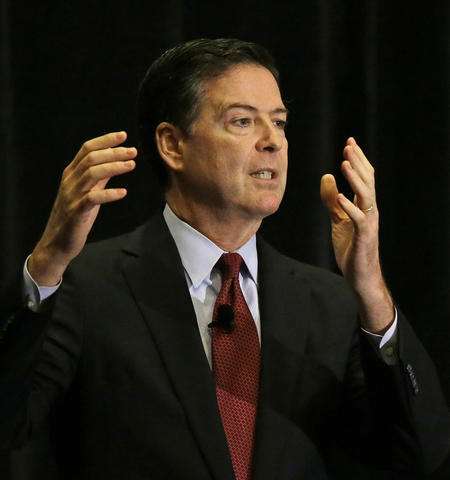 On Friday, in response to a question about the decision, Comey said, "I don't want to talk about the case itself anymore, after four hours and 40 minutes without a bathroom break" testifying before Congress about the FBI's investigation of Clinton's email practices while secretary of state. But he said that it was "unprecedented for the FBI to show the kind of transparency" it did in discussing its investigation of Clinton and recommendation to prosecutors to forgo criminal charges. It is the government's fault for allowing private corporations unrestricted use of code schemes to protect their 'private "intellectual" property'!! When the government compounded their mistake by allowing bribery on an international scale with only Communist and Muslim countries resisting it, and allowed that bribery (Citizen's United, et al) to corrupt the government to such an extent that even 'looking' at their movie codes and 'music'[awful noise] anti-copy and DRM codes was somehow a 'crime', then that finished all the infected governments as effective controllers of this awful problem. What is needed is to destroy all DRM and repeal all 'anti-copy' and 'intellectual property' laws. Give power back to the people. Or the people will take it back. We subsidized entire generations of expert codesters for private gain. We have NO standing to complain how their skills are used as private actors for businesses domestic or for foreign enemies. Yes, have your encryption debate, Mr. Corney. After all the whistleblower revelations of non-stop mass surveillance by a certain country, do you seriously think that consumers will downgrade their devices' privacy capabilities? Right, those with a brain will rather buy their gear from non-US companies. And the same will be true for any company outside the US that buys Cloud and IT gear. Is that the same FBI which was the private police force of the little monster, Hoover? The same FBI which infiltrated anti-war groups in order to defame and is discredit them? The saboteurs? I trust them individually, but not in official operation after serving on a Grand Jury in the Bush Years. Our federal government was corrupted under Bush. The government has NO RIGHT to spy on us. It is US, who must keep a close eye on what they are doing to us. Spying on The People did not save Nicolae and Elena Ceausescu. The SAVAK did not save the Shah, and the KGB did not save the Soviet Union. The DINA, the STASI, and others have revealed the future of our own government agencies which consider The People to be suspects in their own nation. Any government that does not trust its citizens deserves NO TRUST OR SUPPORT from those citizens. It is the government's fault for allowing private corporations unrestricted use of code schemes to protect their 'private "intellectual" property'!! You of curse have no problem whatsoever with unions and the 10,000++ 501c3/4/27 entities (environmental, racial, gender and other Marxists) contributing half a billion in cash and hundreds of millions more in PR and oppo research every election cycle, nor with the billions in free propaganda provided 24/7/365 by the leftling media, since your goal is the destruction of capitalism and the installation of the Hive Collective. Heil 1984! What a joke to hear that communists and Muslims countries bribery, when the entire basis of their systems is built on intimidation, terror, torture, bribery, corruption and extortion. The top brass in utopian Venezuela all became multi-billionaires while the little pawns they championed starved. Marxism is a pathological, homicidal and suicidal mental disease. James Comey lost all credibility when he carefully catalogued the evidence that Clinton committed major felonies and lied over and over to the American people and then declined to recommend indictment while little people guilty of much less languish in prison. This was all coordinated between both Clintons, Obama, the AG and Comey. Note after year's investigation how the FBI only interviewed Hillary two days before Comey issued his recommendation, and she was not even put under oath. The fix was in place long before that. The rule of law, one of the most important safeguards of liberty and freedom, is now officially deceased, thanks to people like Osiris1 and all the other ignorant, useful idiots. The cat's already out of the bag: encryption that is unbreakable and non-commercial is within the grasp of every human who has a connection to the Internet and is smart enough to use it. And it has no back doors.